Wagner’s Siegfried is surely opera’s most disturbing coming-of-age story. The Metropolitan Opera’s Siegfried on Saturday afternoon bought out the absurdity and the complexity of this psychodrama, mostly owing to a stellar cast, who delivered knock-out performances in spite of Robert Lepage’s notoriously bland production. Stefan Vinke, in his Met debut, delivered a formidable performance in the title role. Vinke eschewed the heldentenor steel often associated with the role in favor of a sweetness and a brilliance, especially in the higher register. Although he lacked intensity in the low-register outbursts of act one, by the more lyrical third act his sound had acquired a thrilling buoyancy and captivating luster. Vinke’s Siegfried was not so much brawny and terrestrial, but heady and mercurial, his voice reflecting Siegfried’s youthful excitability rather than his strapping heroism. This is not to say that Vinke’s Siegfried lacked power: he was not afraid to lay on the muscle when required and packed a considerable punch in his forging scene, but, for the most part, played Siegfried on the lighter, more fiery side. He also proved himself very handy with a hammer, battering out Wagner’s fiddly, syncopated rhythms with pinpoint accuracy and remarkable ease while forging a rather plastic-looking Nothung. Indeed, Vinke had a natural stage presence throughout, leaping around on Lepage’s machine with vivacity and swagger. Gerhard Siegel’s gnashing, spluttering Mime was the perfect foil to Vinke’s soaring Siegfried – a touch of the grotesque amongst the sublime. Siegel struck the perfect balance between snarling character-tenorSprechstimmeand saccharine cooing, painting a scintillating, three-dimensional portrait of the Nibelung. It is a testament to the sheer charisma of Siegel’s performance that one felt a touch of empathy for Mime, despite all his bumbling, scheming, and manipulating. Siegel’s Mime had a nervous urgency and a quicksilver physicality which drove the action of the first act; every action appeared spontaneous, utterly in the moment. Siegel had an incredibly generous stage presence, animated and reactive even when not singing, in such a way that uplifted the performances of his fellow castmates. His scenes with Vinke, in particular, were joy to watch, capturing the awkwardness and the pathos of Siegfried’s fraught relationship with his guardian. 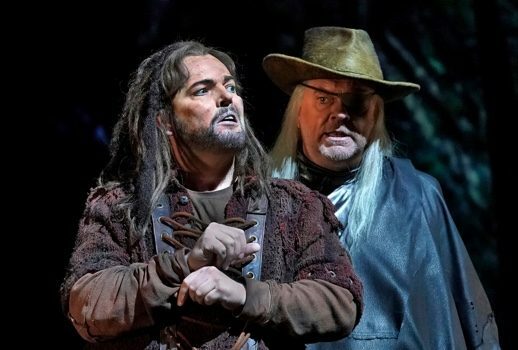 Michael Volle’s Wotan was playful, brisk, and somewhat happy-go-lucky (a stark contrast to Greer Grimsley’s brooding, gritty, severe Wotan in the earlier operas). Volle seemed relish the role’s high tessitura, especially in the opening of the third act, where his bellowing invocations to Erda had a silvery sheen. His lower register had a gratifying warmth, Volle never resorting to grunting or growling to make these notes project. Volle found plenty of humor in Wotan’s “Wanderer” persona, expertly timing his physical comedy with Wagner’s quick interplay of leitmotifs as he riddled with Mime in act one. Volle’s compelling mix of suaveness and whimsicality fit well with his Clint-Eastwood-meets-Gandalf costume, complete with long silver hair, leather coat, and cowboy hat. Tomasz Konieczny’s Alberich was a musical tour de force, sung with a searing intensity and a stentorian energy. Although Alberich’s appearance in Siegfried is rather fleeting, Konieczny managed to one-up his sucker-punching performance in Rheingold, turning a role which so often seems like a rather dissatisfying cameo into a star turn. Karen Cargill bought a world-weary poignancy to the role of Erda, the rich-voiced mezzo dwelling mostly in mellowing chest voice during her brief emergence. Her scene with Wotan lacked dramatic clarity, falling victim to the pitfalls of Lepage’s directorial style: the apoliticism that comes off as ideological confusion, the passionless staging of onstage relationships, and the machine’s tendency to severely restrict singers’ movements. Erin Morley’s Woodbird was suitably sprightly; however, it was let down by the tawdry, pixelated, grossly engorged bird projection. This avian Pac-Man was, at one point, gracelessly projected onto Siegfried’s torso, totally derailing any magic Wagner’s forest murmurs might have held. The opera’s animals were, on the whole, a mixed bag: Fafner-as-dragon (voiced by the reverb-laced Dmitry Belosselskiy) was far more fearsome than the Alberich-dragon of Das Rheingold, but Siegfried’s pet bear looked as if someone was throwing a jumbo-sized Paddington around the stage. Christine Goerke had her moments as Brünnhilde: when she allowed her voice to bloom, it had a full-bodied, rounded sound; however, it often had a thin, wavering tone, and rarely matched Vinke’s power. 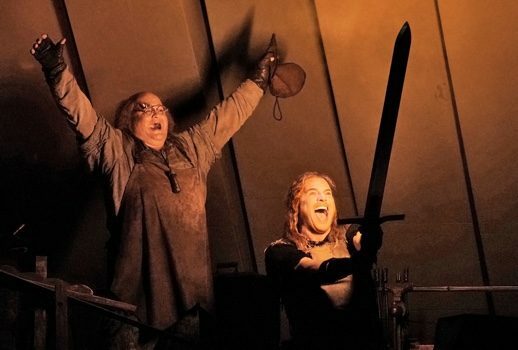 Admittedly, Brünnhilde’s music in Siegfried is unforgiving: it is often very exposed, set against a harsh, transparent orchestration, and, while Siegfried has been warming up for this moment for the last two acts, Brünnhilde must come in cold, launching into taxing octave leaps after lying motionless for a good ten minutes. Yet Goerke’s Brünnhilde lacked the evenness of tone and the raw passion necessary to tie together this complex and pivotal scene. Goerke did, however, sing Brünnhilde with a grace and dignity so rarely afforded to a role often played as a bleary-eyed damsel in distress. This final scene, much like Erda’s scene before it, seemed dramatically confused, as if Lepage was unable to balance Brünnhilde’s confusion, Siegfried’s new-found fear, and their irrepressible attraction to one another. The scene was salvaged by Vinke’s edge-of-your-seat singing, which culminated in a staggering leap to a high C.
Siegfried was, in many ways, also a coming-of-age for Wagner himself, the composer halting progress on the cycle at the end of the opera’s second act to work on Tristan and Meistersinger. The Met Orchestra, under the deft baton on Phillipe Jordan, sounded much more at home in the post-Tristan unendliche Melodie and post-Meistersinger counterpoint of the opera’s third act than in the more repetitive, periodic structures of the second act. Wagner’s woodland music, in particular, felt a little muted and could have used more contrast and verve. The subterranean noises of the opera’s prelude, however, had a razor-sharp clarity, Jordan bringing out Wagner’s unusual timbral palette. As for Lepage’s machine, this was, by far, the most effective it has been in the cycle so far. For the most part, it was stationary, rarely hindering the opera’s action (and providing few precarious obstacles for the singers to navigate), and when it did move, it did so smoothly, barely creaking at all. In the opera’s prelude, the machine conjured an array of settings (most notably, a skin-crawling, worm-infested forest floor) as actors mimed out the story of Siegfried’s upbringing, perhaps the most dramatically cogent use of the technology so far (still, of course, not enough to justify the machine’s exorbitant cost). Ultimately, it was the excellent cast that carried this production; the machine’s most profound achievement was that it didn’t get in the way.